The Power of the American Flag! “The Star Spangled Banner, oh, long may it wave/O’er the land of the free and the home of the brave!” Recover the power of American symbolism! Intensify your Patriotism! Revolutions actively and systematically ignore the past. If not annihilate and destroy a nation’s past. True American history is replaced with multicultural studies, while liberals infiltrated into American colleges and universities re-write history – with the dark agenda to ultimately destroy our Constitution and Bill of Rights. Simply put, those who are in control write and teach “history,” funded by amoral, criminal, occult and perverted, survival-of-the-fittest, globalist-elite tyranny; de-Christianizing, de-humanizing, de-nationalizing and de-stabilizing. But the “moral high ground” with a grass-roots appearance is what the liberal left prizes – all the time based on lies and not true morality. “Racism” and “racist” is one of their prized words, contrived originally by Trotsky, to counter growing European opposition to the Marxist multicultural takeovers of unassimilating, nationalism-denying, criminal internationale-sanctioned immigrants into European countries. But while globalist elite impose on America a civil war, true Americans need the bulwark of a counter revolution. The Soros-funded Left imposes its Divide-and-Conquer revolutionary agenda, seeking to destroy the past “Alinsky style” and reduce all to rubble. But all true Americans, hundreds of millions, need to counter this nonsense by strengthening the American past. And the best place to start is with the American Flag and all that it stands for and symbolizes! The mysterious influence of patriotism has its fountain head in the flag of our country. It gleams upon us from the stars; it is fastened to our existence by the immovable, unchangeable stripes. Its brilliant red teaches us to remember the heroes who brought it into existence to symbolize the birth of freedom. Its cerulean blue is emblematic of truth, of honor, of principle, and of that kind of glory which is everlasting. Its spotless white typifies the purity of purpose which actuated our forefathers who conceived it. Its stars are the coronet of freedom; its stripes, the scourges of oppression. Wherever it appears, it is the symbol of power and the shield of safety; who clings to it, not all the tyrants of the earth can tear from its protection. There is no influence more august, there can be no holier thrill than that which the flag of our country inspires in every patriot’s breast. An American poet has aptly termed our banner the “Scarlet Veined.” It seems like a channel through which the heart throbs of a mighty nation impel the life giving, liberty loving fluid of its people. It generates the atmosphere of freedom that we breathe; it creates the higher impulses which we absorb; it speaks to the highest and to the most lowly in the same even tone of power, of steadfastness, of unalterable and unqualified promise. A volume could be written upon the early history of the Stars and Stripes. “My hand hoisted the first American flag,” declared John Paul Jones, who served as lieutenant on the Revolutionary frigate Alfred. But it was probably at Fort Schuyler, then besieged by the British, that the Stars and Stripes received its baptism of fire. The beleagured patriots had some difficulty in finding materials of the proper color. The flag’s first important battle was that of Brandywine, where it suffered a defeat that was speedily and amply avenged when it flew in triumph at the capture of Burgoyne’s army at Saratoga! Picture America’s grand men, our national creators, as they were gathered together in that grim old Philadelphia chamber, to consult and to agree upon the adoption of a national emblem, as they had been directed to do by the Continental Congress. Just as Washington rose from his place, the sunlight streamed through the diamond paned window of the gable, high above their heads, and fell upon the table before him. The prismatic gleams begat colors and resolved themselves into shape before his eyes. The framework of the window separated the bars of light in their descent, so that when they met again upon the table they became stripes of red and white. Washington raised his eyes, and through the window saw the blue dome of heaven beyond, where so many nights, upon the battlefield, he had watched the glimmering stars. Instantly he saw the flag of freedom. The paragraphs on the American Flag from “The Flag of Our Country” by Frederic van Rensselaer Dey, taught to American students in 1898. It must be once again taught, understood and absorbed, as American schools are rescued from anti-nationalist liberalism, a Constitution-hating law unto itself. 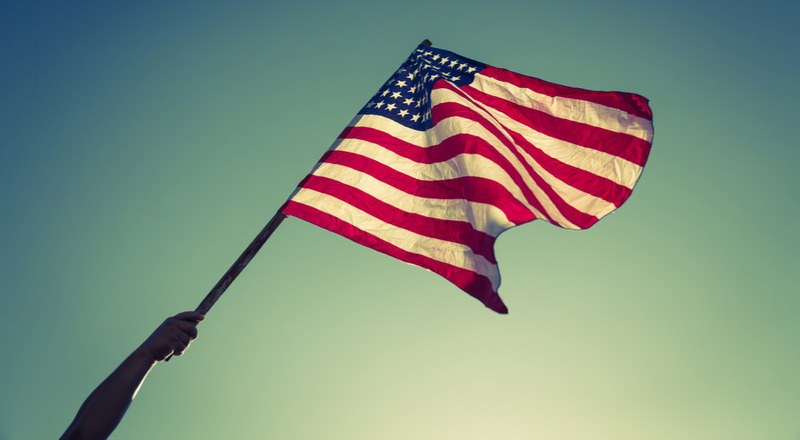 The American Flag must be restored in hearts as a much more powerful symbol of freedom. * Occultist Francis Bacon started humanity on the course of “progress” while abandoning true wisdom of the past and the ancients. The liberal philosophy of Baruch Spinoza is equally heinous. These and the teachings of occultist revolutionary Saul Alinsky must come to a permanent end.